Fine. 0140187650 Ships promptly from Texas. Very Good. Trade paperback (US). Glued binding. 312 p. Penguin Twentieth Century Classics. This report on the trial of German Nazi leader Adolf Eichmann first appeared as a series of articles in "The New Yorker" in 1963. This edition contains further factual material that came to light after the trial, as well as Arendt's postscript commenting on the controversy that arose over her book. An excellent piece of reportage, Hannah Arendt's "Eichmann in Jerusalem" is a thorough account of a trial which attracted huge international attention. Professor Arendt handles her subject deftly and with a light, dispassionate touch which I frequently found stylistically reminiscent of H.L. Mencken's journalism. 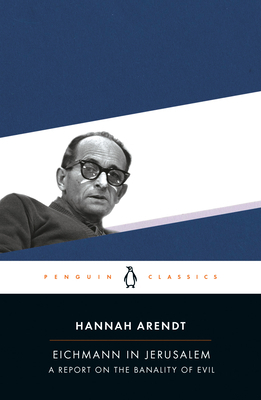 A good deal of thoroughly unpleasant material is dealt with in the course of the trial, and Arendt's writing style neither trivialises nor sensationalises any of this. The philosophical niceties of Eichmann's guilt are thoroughly explored, as is the uncomfortable fact of the illegality of his abduction by Shin Bet agents. Eichmann's craving for importance in the world and for recognition in his own right appear, eventually, to be the main factors in his downfall, and indeed may have led to the lack of resistance whcich he offered to his captors. Such insights into the man's character are built, for the most part, chronologically, as the trial unfolds, which gives the work the necessary pace to avoid becoming bogged down in procedural detail. Eichmann's sentence was never any more in doubt than that of the thousands he dispatched to the camps, proud of his efficiency in so doing. Indeed, it's hard to argue that it could have been otherwise, and at times even the defendant seemed keen for the gallows. Still, Arendt pays tribute to the professionalism of the trial judges, not only for their impartiality in judgement, but also for their resistance to the attempted politicisation of the proceedings by David Ben-Gurion and his administration. An excellent, pithy account of a fascinating trial.